It's been a long time without news here. This will be the last post in Blogger. I've decided to have a more dynamic Web presence, to continue publishing news about my apps and to have where to talk with their users. 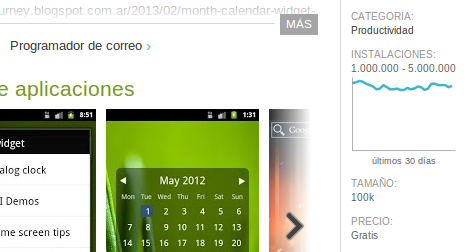 So Month Calendar Widget and its extension apps are heading to the brand new MCW and extension apps Google+ community. Version 1.5.5 of Month Calendar Widget is on Google Play now, and this time it's accompanied by a new app: MCW Lockscreen Extension 1.0.0, the first extension to the widget. The idea of an extension is to provide new features as an option, without bloating the main widget. More on this in a separate blog post, I promise! Resizing for all launchers: The widget is resizable natively with this version, that means it works with all launchers, provided you are using Android 3.x or later. Please note that this feature works only when the Stretch widget option is activated. If you don't show it stretched, resizing will "lie": the widget will occupy more space in the screen but will look the same. Another note: if you resize the widget too big, dates will probably look too small. A future version will make font sizes adjustable while resizing happens. MCW Lockscreen Extension version 1.0.0 as I said is the first extension that complements Month Calendar Widget, and once installed it simply allows putting the widget in your lockscreen (Android 4.2 or greater is required). In the Google Play app description you will find how to use MCW in the lockscreen. By the way, this extension app is the first paid app I'm releasing, hope that it will sell well ;). Future extensions most probably will be paid too. EDIT Nov 29 - Just one final clarification: the introduction of extensions doesn't mean the basic widget, that is the Android widget that you are using for free, won't be updated anymore. It will. This will be explained more extensively in the blog post I mentioned at the beginning. As always, I welcome any feedback you may have. Please feel free to leave a comment or send me an email. I hope you enjoy this version, it took longer than expected but I'm pretty sure it's worth it. Last news in version 1.4.0 is a removed feature: the Autoadjust column width setting isn't needed anymore because of the mentioned internal redesign. The option was introduced in version 1.3.0 in order to solve misaligned dates in some devices. The layout improvements of 1.4.0 make this setting unnecessary. Next step: define a clear roadmap for Month Calendar Widget, including the future pro version. Version 1.3.1 is now on Google Play. The widget looks good now for Android 4.x users that saw a clipped widget on version 1.3.0. Also Android reports the correct sizes, 3x2 and 4x3. Many thanks to N.Ch., d_k and Keving Hastings, the users that helped to diagnose the problem. Sorry for the inconvenience introduced in the previous version. Stay tuned for more upgrades in the future.